The concept of this restaurant, Kurama, is providing a place for tourists to enjoy eating not only authentic dishes with fresh ingredients of Kyoto but also seasonal dishes as well. Their menu is fairly original, and the amount of one portion is huge! One order comes with at least 3 side dishes with a main dish. The unique feature of this restaurant is that there is a certain way to eat a meal like Ohitu Gozen, a gorgeous rice bowl meal set. You can choose boiled whitebait, chicken with Kyoto leak or tempura over the rice. In the middle of eating your meal, it is recommended to pour Dashi stock into the rice and create something called Ochazuke. Its taste totally changes so that you can enjoy it as if you are eating 2 kinds of dishes. Sake that is from Fushimi, located south of Kyoto, are also offered. It comes along with shrimp and vegetables tempura, soft-boiled egg, miso soup and pickles. Firstly, it is recommended to eat chicken rice bowl mixed with Kyoto leaks. And then, try putting the soft-boiled egg over the rice! It is so creamy you will become obsessed with the taste. Finally, pour the dashi stock! The suggested eating guideline is also in English so look for assistance. If you are a big eater, why not order this? 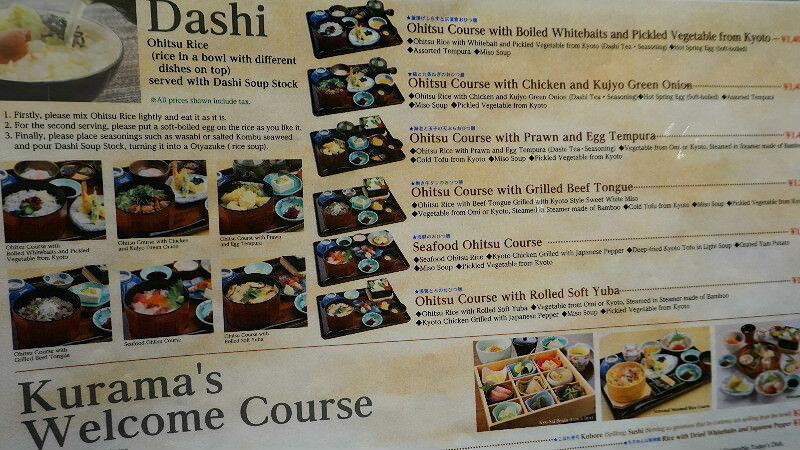 There are 9 kinds of original Kyoto dishes provided in a lunch box. All of them are fantastic, but crispy fried shrimp is the most recommended! The taste of shrimp itself is so rich. Sushi or rice with whitebait can be chosen. Note that the portion is very large. 5 assorted Kyoto style pickles are worth having. They are crunchy and a little bit salty making it go very well with Sake. Vegetables are changed according to the season. Try this Kyoto style pickles before leaving Kyoto! English menu shows how to make Ochazuke. Vegetables are changed according to the season. Please ask a staff what vegetables are being used that day. If in Kyoto, you have to try yuba. They also have seasonal dishes like pike conger. The restaurant is inside Kyoto Station so it is easy to get to, so this restaurant is recommended for those who want to enjoy Kyoto cuisine in a casual setting. English and Chinese speaking staffs are available (not always there). All menus are in English and written how to eat in English. So you can enjoy your meal the same as Japanese people do.